You can also get your first £5000 of investments managed free for a year when you sign up now* via a link in this post. While many people have some kind of workplace pension, this is not true for all. Self employed people are a prime example of those who may not have a pension in place and they are not alone. Even those who do have a workplace pension may find that it will be inadequate to meet their needs in retirement. In these cases, setting up a SIPP (self-invested personal pension) on the side might well be useful for later life. On top of this there are tax advantages of investing via a pension. The first of these is that – depending on your salary – your pension contributions are eligible for tax relief at 20% or more. So for every £100 you put into your pension, you are only in reality paying £80. Any money you contribute to a pension will also grow free from income or capital gains tax. Finally, we really can’t underestimate the power of compounding. Compounding basically means that the money you invest effectively behaves a bit like a snowball. As you add more money to your pension pot, the gains made each year are then added to the pot. The next year you will make gains not only on the contributions you’ve made, but on the previous gains too! As the years pass by, this can have a powerful effect on your overall pension pot. It also means the younger you are when you start a pension, the bigger the compounding will be. Now we know why a pension could beneficial, you might be wondering why Wealthsimple* might be a good choice? The things that make Wealthsimple attractive to most for their pension will be their low fees and simplicity. As we’ve mentioned already, the fees charged by robo-advisors like Wealthsimple are very low compared to those charged by typical wealth managers or pension funds. This could help to grow your pension pot at a much faster rate. Secondly, some people might like the option of having their Stocks and Shares ISAs, Junior ISAs, SIPP and General Investment accounts all hosted with a digital wealth manager like Wealthsimple. This is because it could help them in getting a true perspective of their overall financial position. There’s also the option to combine all of your old pensions and bring them over to Wealthsimple. This can be true of both workplace and private pensions. There may be issues in doing this regarding exit penalties, though. If you have any doubts in this area then be sure to seek independent advice from a local expert*. Finally, the balance of human advice and digital wealth management could mean that you get the best of both worlds. While it’s quite possible to leave your investments in the hands of Wealthsimple’s Nobel-Prize winning strategy and let them make all of the investment decisions for you, it’s good to know that you also have unlimited access to human advice too. 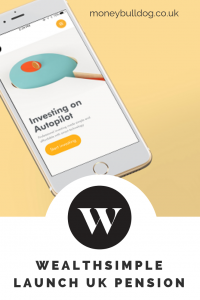 If you’re frustrated with the high fees being charged by your current pension provider then perhaps Wealthsimple* could be a good option for you. The same could be true if you have no pension arrangements at all. With Wealthsimple, you can leave all of the day to day investment decisions in their hands. At the same time you have access to a human advisor when needed. You can also transfer your other investments to the company to have all of your investments in one place. Also, don’t forget to sign up via a link in this post* to get your first £5000 of investments managed free for a year. It amazes me if there are people in the Western World today who are not saving for a pension. There is a great pension crisis looming whereby our generation will struggle to retire. Prepare yourself today!